I fell asleep twice during Project Runway last night. Twice. It’s an hour long show. So, obviously work is not getting done on my novel. My original plan was to get up earlier, my brain initially thought an hour earlier sounded good, and get in some writing time before getting ready for work. This was a good plan until two things happened. First, The Baby started teething. Again. He decided approximately 12:30 am was a good time to get up and start his day. Second, the thought occurred to me that getting up an hour earlier would mean I’d be setting my alarm for 4:30 am. 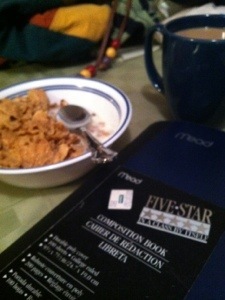 Just me, my cereal, my coffee and my notebook. Lets be honest, I’m not getting pages upon pages written. It’s 30 minutes of time. Not to mention, I’m horrifically inept at multitasking eating cereal and writing at the same time. But…it’s something. It’s more writing than I did last week. I finished a chapter. I critiqued three 15 pages pieces for my witting group. I feel unstoppable. I’m also falling asleep writing this. You can’t win them all. But, hey, it’s a start. I’m debating setting the alarm 10 or 15 minutes earlier. Maybe another week in status quo and I’ll regroup. It’s an exciting premise. It feels good to have a plan. And on a somewhat unrelated note, can I just say I miss Emilio Estevez? It’s a cruel world we live in where he falls off of the face of the earth and leaves us with Charlie Sheen. Ick.